Like scabies mites, ringworms are parasites that thrive on the human body. Ringworm is a skin infection not caused by worms. It is caused by fungi. Fungi, incidentally, are living organisms which cannot be classified as plants or animals and hence classified as a separate kingdom called’ Dermatophytes. The term ‘Derma’ means skin and thus ‘Dermatophytes’ refers to skin fungi. They cannot make their food and thrive on other living or dead organic matter. Like scabies they cause lesions on the skin. However, the ringworms reproduce by the formation of spores. Fungi which affect the skin live on the dead layer of the skin known as ‘keratin’. It was believed in the past that the infection was caused by a worm. The name could be a reference to the characteristic red ring formed on a person’s skin. Though later it came to light that it was caused by fungi, but the name stuck and the infection continues to be called ringworm. The infection is medically known as ‘tinea’ which comes from the Latin word meaning ‘growing worm’. The infection normally affects the scalp, the groin, the feet, and the nails. Like scabies, it is very contagious and is difficult to prevent. The infections spreads by direct skin-to skin contact with a person who is infected or coming into contact with personal belongings of a person such as bed spreads, towels, etc which contains the infection. Tinea faciei face except in the area of the beard – red, scaly patches with indistinct edges. Tinea manus palms and the spaces between the fingers tinea manuum hands, especially the palms and the spaces between the fingers. thickening (hyperkeratosis) of the above areas. Usually appears alongwith tinea pedis. Tinea unguium fingernails – Fingernails become yellow, thick, and crumbly. The infections caused by ringworm are akin to scabies in a sense that scabies is also a skin infection like ringworm. Again scabies as well as ringworm are contagious diseases which mean that they both spread through physical contacts. Scabies, like ringworm infection spreads through skin-to-skin contact with an affected person. However scabies differs from Ringworm in that, scabies is caused by Sarcoptes scabiei, a mite and ringworm is caused by fungi. Another notable difference between scabies and ringworm is the fact that in the case of Scabies, pimple like eruptions, burrows or rashes of the skin are noticeable, whereas ringworm is typically characterized by the appearance of round spots at the affected area. Itching of the affected area though a distinct trait of scabies is relatively less common in the case of ringworm and is found only in the case of ‘ Barber’s itch’, a type of ringworm infection.. 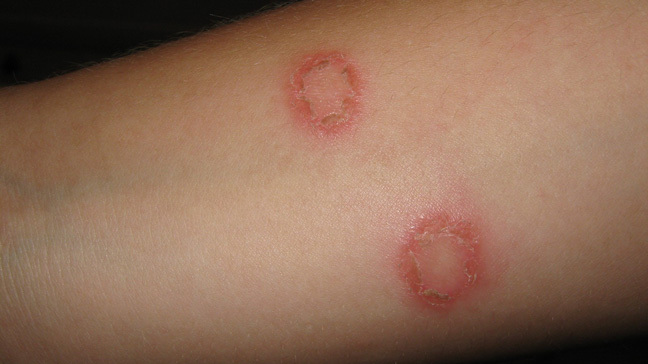 Unlike scabies, ringworm is classified into many types depending on the location of the infection.